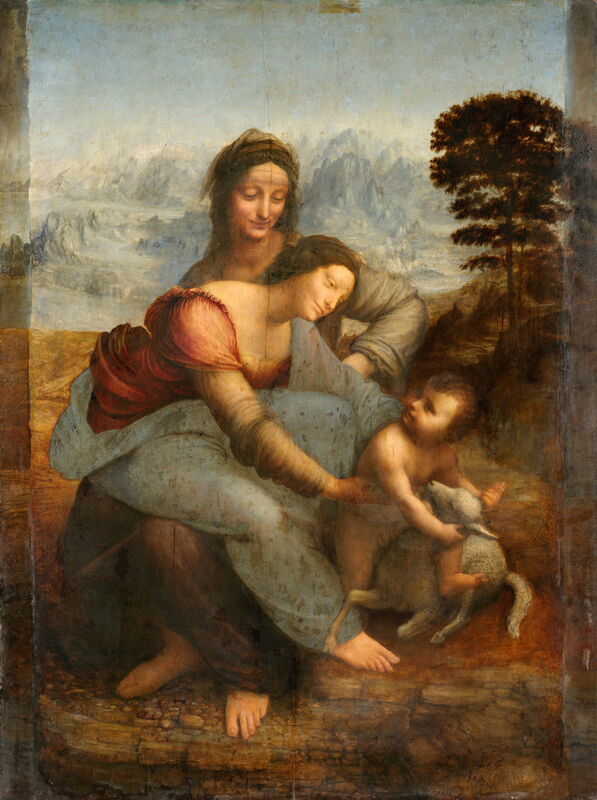 Leonardo da Vinci (1452–1519), The Virgin and Child with Saint Anne (c 1503-19), oil on poplar wood, 168 x 130 cm, Musée du Louvre, Paris. Wikimedia Commons. From 1503 to 1506, Leonardo da Vinci lived and worked in Florence, where his major project and one of the most substantial of his artistic career was a mural of the Battle of Anghiari for the Palazzo Vecchio there. 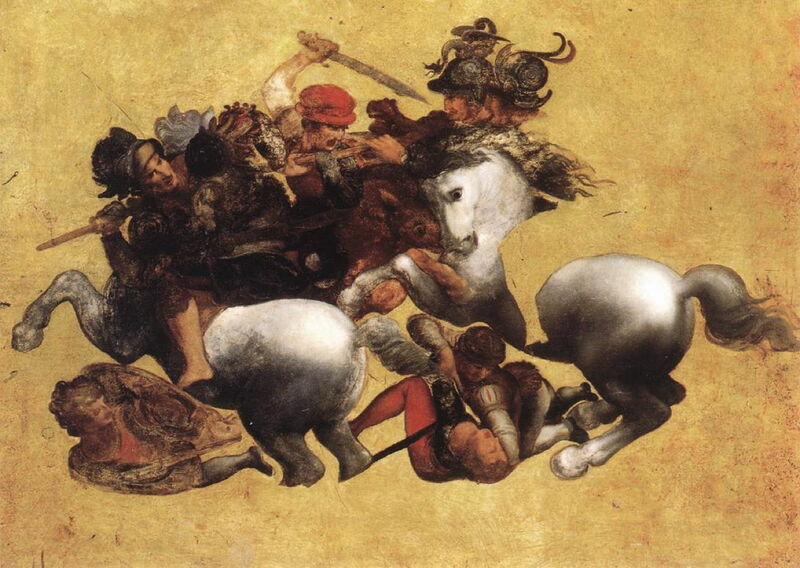 This was to be accompanied by a painting of the Battle of Cascina which was painted by Michelangelo. Leonardo received this commission soon after he arrived back in Florence, in the autumn of 1503, and worked on the cartoon during 1504. He seems to have been painting it from scaffolding in 1505, but took leave of absence from his work there in 1506, and never returned to complete it. Artist not known, after Leonardo da Vinci (1452–1519), Tavola Doria (The Battle of Anghiari) (1504-06), oil on panel, 85 x 125 cm, Galleria degli Uffizi, Florence, Italy. Wikimedia Commons. For a long time, it was claimed that this oil painting, known as the Tavola Doria, was a trial panel made by Leonardo immediately before starting work on the wall. It is, though, more likely to have been a copy made by another artist at the time. It gives an idea, though, of the tightly-composed small group which Leonardo chose to paint. 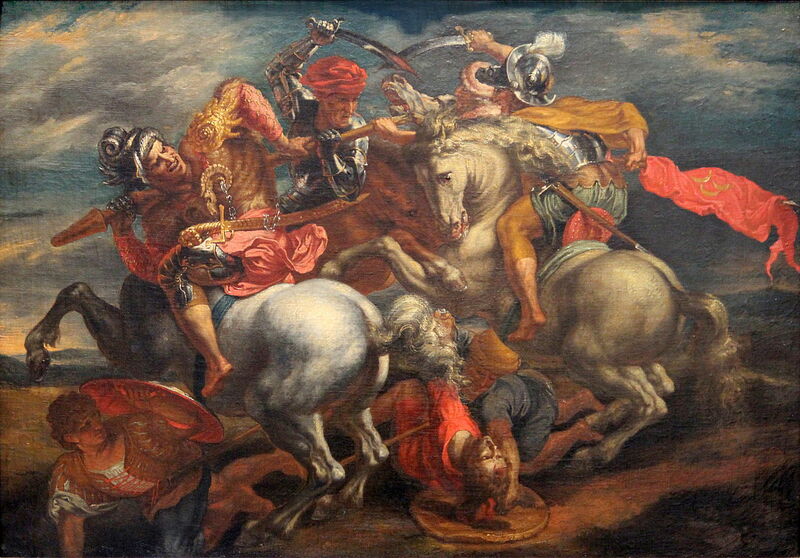 Peter Paul Rubens (1577–1640) (attr), after Leonardo da Vinci (1452–1519), The Battle of Anghiari (date not known), oil on canvas, 82.5 x 117 cm, Akademie der bildenden Künste Wien, Vienna, Austria. Image by Jean-Pol GRANDMONT, via Wikimedia Commons. As Peter Paul Rubens couldn’t have seen Leonardo’s original, this undated version of The Battle of Anghiari attributed to him was probably made from the latter’s preliminary drawings, and is almost certainly more extensive that the mural itself, if the evidence of the Tavola Doria is to be believed. Tragically, Leonardo’s wall painting was destroyed in the middle of the sixteenth century. There have been many subsequent attempts to reconstruct what it might have looked like, but the Tavola Doria and Rubens’ fuller treatment are probably the best that we will get. In 1506, Leonardo returned to Milan, which was still under control of the French. He went back to Florence temporarily in 1507, trying to sort out his late father’s estate. The Virgin and Child with Saint Anne does appear to be an original painted by Leonardo, although it is unfinished in several places, and hasn’t survived the years well. There is also great controversy over when it was painted, and for whom. It can be seen as a late culmination of a series of earlier studies and possibly paintings, dating back to the Burlington House Cartoon from around the turn of the century, and is therefore dated to anywhere from 1503 to Leonardo’s death. It has at some time been widened by the addition of a strip of oak at each side. Most striking about this painting is its strongly pyramidal composition, which was to influence several of Raphael’s paintings, and to become one of the defining features of composition during the High Renaissance in Italy. Numerous artists also made copies, attesting to its wide recognition as a masterpiece at the time. There is greater mystery over whether Leonardo ever painted Leda, but there is good evidence that he arrived at at least one and probably two compositions which were then turned into finished paintings by others. 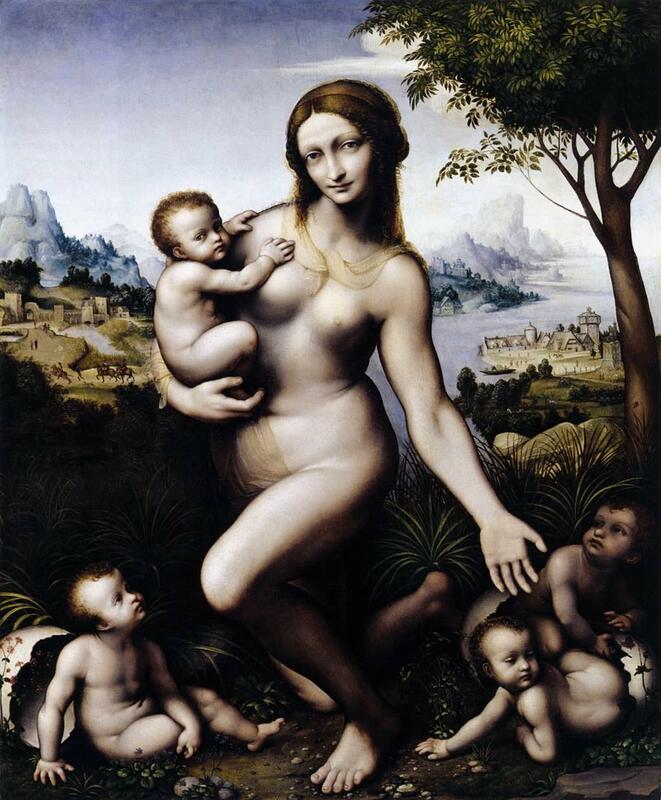 Giampietrino (1495–1549) (attr), after a design by Leonardo da Vinci (1452–1519), Leda and Her Children (c 1508-13), oil on panel, 128 x 105.5 cm, Museumslandschaft Hessen Kassel, Kassel, Germany. Wikimedia Commons. Leda and Her Children, probably painted between about 1508-13, and now attributed to Giampietrino, may be a realisation of one design. In this, Leda kneels among her children conceived in part from her union with Jupiter in the form of a swan. The children are Castor and Pollux, and Helen and Clytemnestra. This work is likely to have been painted in Leonardo’s workshop in Milan, possibly under the direct supervision of Leonardo. Investigations have shown that under this painting are traces for a copy of The Virgin and Child with Saint Anne shown above, which implies its panel has had an unusual history. 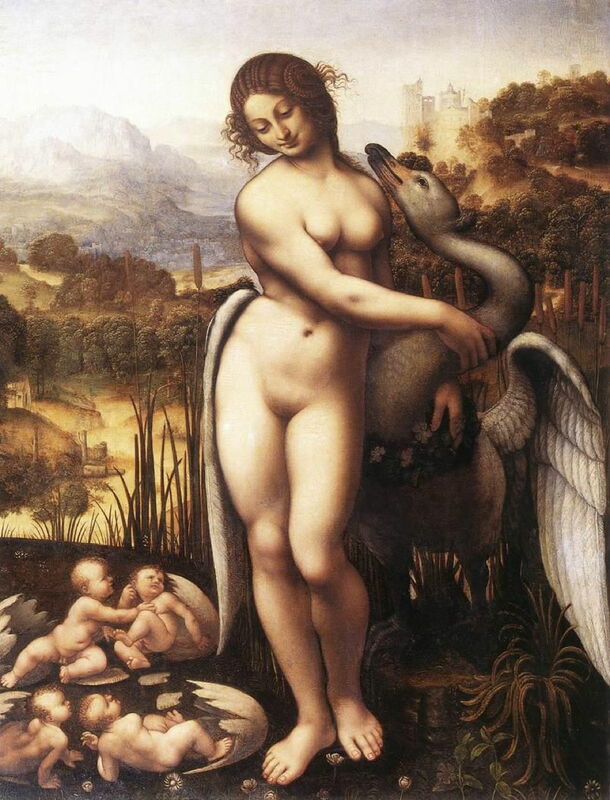 Cesare da Sesto (1477–1523) (attr), after a design by Leonardo da Vinci (1452–1519), Leda and the Swan (c 1505-15), oil on panel, 69.5 x 73.7 cm, Wilton House, Salisbury, England. Wikimedia Commons. There are several different versions of what appears to have been Leonardo’s other composition with Leda, including this, now attributed to Cesare da Sesto, known as Leda and the Swan, and dated to about 1505-15. Here she is standing as her four babies hatch from eggs to the left, her arms cradling the neck of the divine swan. In the autumn of 1513, Leonardo moved to live much of his time in the Belvedere in the Vatican, in Rome. Posted in General, Life, Painting and tagged da Sesto, da Vinci, Giampietrino, painting, Raphael, Rubens. Bookmark the permalink. A part of Art History that makes it all the more ‘real’ – process, evolution of a piece and artistic (human) interaction with inanimate canvas.